Nationwide, approximately 7.6 million animals enter animal shelters, and almost 3 million of them never make it out. In 2009, a public service ad campaign launched named The Shelter Pet Project. They were focused on spreading the word about pets in shelters being marvelous and loveable, and encouraging adopters searching for their new forever-friend to look within shelters first. Many people shy away from picking an animal from a shelter, wary of the emotional baggage these animals may have. Adopt a pet from a local shelter! Chances are you will find a dog or cat you will love, and no doubt they will love you. • You are saving a dog or cat’s life by providing a new home. • Most dogs and cats are in shelters through no fault of their own. There may have been a death in the family, a divorce, a new baby or a move. Some animals may have had behavior problems that owners didn’t try to solve. • An adoption fee at a shelter is much lower than the cost of buying a dog from a pet store or breeder, and the fee helps support the shelter. • The majority of shelter dogs are spayed or neutered before adoption, saving you the cost. • Most shelters provide physical exams and vaccinations. An increasing number of shelters provide microchips to help you locate lost animals. Whenever you acquire a dog, either from a breeder or the ASPCA, it will need some training to transition into a new household. The majority of shelters evaluate each dog. Ask to see the evaluation if there is one. This information can help you make your decision. Some shelter staff and volunteers work with dogs on housetraining and basic obedience before they’re adopted. There is an increase in an ASPCA adoption program named Meet Your Match which successfully matches animals with owners. Prospective owners fill out surveys that help staff try to make a good owner-pet match. It’s important to keep in mind exactly what you want in a pet. • Do you want your dog to travel with you? • Do you want a pet that will be good with your children? • Will this new pet get along with a pet you already have? • Would you like a pet that can take brisk walks or runs with you? • Consider the size of your home or apartment. If you live in an apartment, what are the pet regulations? 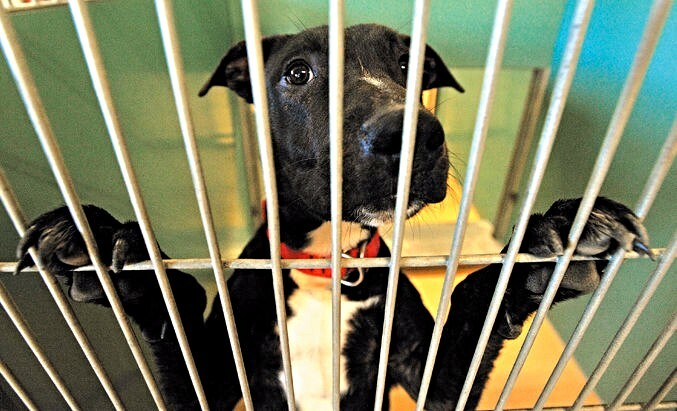 Before you visit the shelter, compile some questions to ask staff. Staff members may have access to an animal’s past. They can also fill you in on its personality. What do you know about a dog’s history? Where did it come from? Was it turned in by its owner or was it a stray? If its owner turned it in you should ask to see the intake information, such as a medical history. Did you conduct a behavior evaluation on this dog? If so, what were the results? How would you describe the animal’s personality and behavior? Does he like other dogs? Does he like children? How is he with cats? Is he easy to walk on a leash? What do the volunteers think of him? Is he affectionate, aloof, calm, energetic, fearful, shy, or friendly? Experts advise that you walk through the entire kennel area to see which dogs and cats are appealing to you. Watch how they react to other people. See how they react to you. Ideally you will see friendly animals that wag their tales and want to greet you. If the animal is shy this pet may bloom if there is a small household. But it may not fare well if there are active young children. Ask shelter employees and volunteers to honestly tell you which pets will adjust well to a new home. However, if a dog growls at you or a cat hisses repeatedly, these are obviously not good signs. When you spot a good candidate, ask to visit with the animal outside its kennel. Try to play fetch or let it tug on a rope toy and observe its behavior. ASPCA officials advise bringing your children to the shelter to see how animals react to them. A dog or cat that retreats from children may not be the best choice. Also, check with staff to see how the animal reacts when he is disturbed when eating or playing with toys. If you have any doubts, it’s a good idea to ask the shelter to hold your choice for a day or so. Most shelters will do so. Also, if you have any qualms, hire a dog trainer, vet or behaviorist to give their opinion. Also Certified Applied Animal Behaviorists (CAABs) and Certified Professional Dog Trainers (CPDTs) can give you an objective assessment of the dog you are about to choose. This will save effort and heartbreak of taking home an animal you have to bring back. Are You a Responsible Dog Owner? It’s National Dog Week!